Sri Lanka Telecom (SLT) Chairman Kuma-rasinghe Sirisena yesterday said Polonnaruwa is earmarked to become Sri Lanka’s first-ever ‘Smart City’, with the Government planning to launch several pilot projects in the areas of education, health, and transportation, before expanding to Port City, Colombo. “The Government is currently considering to transform Polonnaruwa as the country’s first-ever ‘Smart City’, enabled with smart health, smart education, and smart transportation, that will accelerate economic development and social progress in the city,” SLT Group Chairman Kumarasinghe Sirisena told Daily FT on the sidelines of Huawei Lanka ICT and Carrier Congress 2019 in Colombo yesterday. 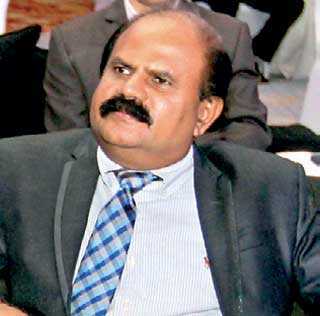 According to him, the Smart City concept could be implemented in various verticals, as SLT has now covered the entire country with ultra-fast fibre-optic connectivity, and in the initial stage they are considering to roll it out as pilot projects in the immediate services, including education, health, and transportation. In addition, Sirisena said that they have also signed an exclusive fibre connectivity project with Huawei for the Smart City in the Colombo Port City. “We believe there is a lot of value that Huawei can bring to Sri Lanka in building more smart cities,” he added. The Chairman also pointed out that they hope to launch a range of digital transformative products within the next couple of months, under the patronage of President Maithripala Sirisena and Prime Minister Ranil Wickremesinghe, to fast-track Sri Lanka’s journey towards becoming a digital economy. “We are going to connect 2,500 schools through wireless connection to enable smart education in Sri Lanka. The initial discussions have been completed, and we hope to connect these schools within this year,” Sirisena added. Noting that the Group recorded a revenue of Rs. 75 billion last year, he expressed confidence that with the launch of the digital transformation projects, the Group will be in a position to reach an ambitious revenue target of Rs. 85 billion by the year end. SLT Chief Executive Officer and Chief Commercial Officer Kiththi Perera, speaking at the event, said that they were working on a number of initiatives in the consumer and commercial spaces with introducing cloud storage, fintech platforms, and over the top (OTT) platforms. “We hope to introduce a range of enterprise and business solutions based on artificial intelligence (AI), machine learning, internet of things (IoT), and industry-specific solutions,” Perera said. He pointed out that SLT was also in discussion with the Power and Energy Ministry to establish Smart Grids and Smart Meters.